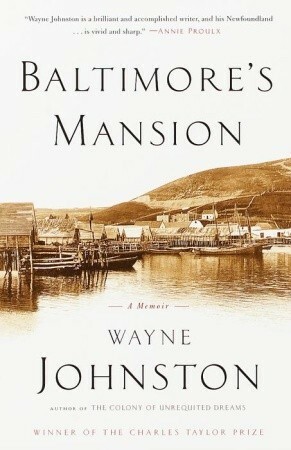 Baltimore’s Mansion is Wayne Johnston’s memoir of growing up in Newfoundland. Not just growing up in Newfoundland, but growing up there in an anti-Confederate family not long after Newfoundland became the tenth province of Canada. The book is full of anecdotes about his family, mostly his father and grandfather. In fact, Johnston manages to hold onto his own privacy in his memoir by putting most of the focus on his father’s story. Most of what we see of Johnston himself is in reference to his father. Wayne Johnston was born in 1958, nine years after the referendum that led to the joining of Newfoundland to the rest of Canada. Despite this gap, Johnston grew up under it’s shadow, and it seems to have had a big impact on his life. He talks about the many family gatherings that took place, as he was growing up, where the conversation always came around to the controversies surrounding the referendum. As though there might be something that could still be done about it if they discussed it long enough. When I was six, I believed what my parents and all my aunts and uncles wished were true, that the Avalon Peninsula, “the Avalon” we called it, was itself a country. The book tells many stories about Wayne’s father and grandfather; out fishing, time spent in the forge, collecting ice for cold storage. They seemed to be very close, but then something happened on the beach as his father was saying good-bye before his first trip off the island. Wayne spent many years wondering what happened. There is no way of saying goodbye to my father that will not remind him of the day on the beach in Ferryland when he and Charlie said goodbye. Wayne left Newfoundland for the first time at the age of 23. He came back 5 years later, then left again at age 30. He wanted to be a writer, but found he could only write about home when he was away from it. …I have chosen the one profession that makes it impossible for me to live here… I can only write about this place when I regard it from a distance… my writing feeds off a homesickness that I need and that I hope is benign and will never go away, though I know there has to be a limit… someday it will break my heart. I get the feeling when reading this book, that the author’s thoughts about Newfoundland are all jumbled up with his thoughts about his father. And that his father’s thoughts about Newfoundland are all jumbled up with thoughts about his own father. I don’t know if this is meant to be the case, but it is the feeling I get. His father and grandfather were both so fiercely patriotic, that it couldn’t help but to have rubbed off, and I think this is apparent, too, in this book, but also in some of the other books he has written. Almost all of his books are set in Newfoundland. One of Johnston’s most celebrated books, The Colony of Unrequited Dreams, is based on the life of Joey Smallwood, even though he writes in his memoir, “The enemy was “Joey”. It seems I always knew that. I knew it before I started school.” When I read that book, I don’t remember any indication that “Joey” was considered the enemy. Does this mean he has reconciled with the Confederation of Newfoundland? Something his father couldn’t do? Or does it just mean that he is a good writer? 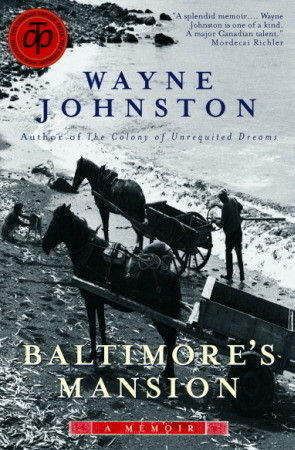 I liked Baltimore’s Mansion, but I didn’t like it as much as I like Johnston’s fiction. But, you shouldn’t go by that entirely, since I generally do prefer fiction. I am happy that I read it. It is always interesting to get further inside a writer’s mind, and learn about the places and people he or she came from. If you read this book, you will be regaled with stories about the referendum, peppered with descriptions of all types of weather and conditions of the sea, dealt touching stories of fathers and sons, and experience feelings of nostalgia for a land that you probably have not even set foot on. It was a warm summer night. I had not been up this late before, let alone outdoors at such an hour. It seemed to me that this must be the stuff of night, furtive exchanges like this between adults about things whose existence they could not acknowledge in the light of day. Only on TV and in photographs had I ever seen the world alleged to exist beyond the shores of Newfoundland. I had read about it in books, but any book not set in Newfoundland was to me a work of fiction. The land, he once told me, is more important than the country. The land is there before you when you close your eyes at night and still there in the morning when you wake. No one can make off with the land the way they made off with the country in 1949. … he will come back to this place that he sometimes thinks he hates, while I who never think of it with anything but love must stay away. I thought it was interesting that he could only write about his home by being away from it. It does make sense. I’d heard this a lot from fellow expats when I was living overseas (the ability to see their country objectively only when they were far away). It must be interesting to read his memoir along with his fiction – I wonder if doing so gives you more insight into the author himself? I am reading Haruki Murakami’s short memoir and I began to think that I should have read his memoir before attempting his more “out there” fiction. I think it does give a little more insight into some of his fiction, and what he has chosen to write about. Also, when I was looking for information on him, I found his website to be bare-bones. He seemed like a very private man. Then, I found this to be the case again while reading his memoir and finding it to be mostly his father’s story. I also thought it was interesting, but sad too, that he could only write about his home by being away from it. I still have never read anything by Murakami, although I have wanted to for a long time. Let us know if his memoir gives some insight into how his mind works! I think I’ll try this memoir. I was surprised to read that you prefer fiction to memoirs. Why is that Naomi? To me it depends on the writing. Huh. Good question, but I don’t really know the answer. I sat here and thought about it for a while, and the only thing I could come up with is that, with fiction, anything can happen, and any writing style can be used to convey it to the reader. I have read some very good memoirs, and some of them tell amazing stories, but, for me, they just don’t quite spark my imagination like fiction does. Do you have some memoirs you could recommend? Just reading another book about Newfoundland, Michael Crummey’s River Thieves! If I could just get through all of the books on my massive list, I’d probably just read every book you select. Another great review that makes me want to read the book! When I first saw this I thought it was going to be fiction. Usually I don’t go in for memoirs, but this interests me. i think that many people my age and younger forget that NFLD hasn’t always been a part of Canada, and that Canada as we know it now is actually quite young. Thanks. I was thinking the same thing as I read this book. Newfoundland hasn’t been a part of Canada for very long at all, really. It seems strange. And, I would never have thought there would have been such long-standing controversy over the whole thing. If any of that interests you, then you might like this book.